As soon as you walk into this home your eyes are drawn to the serene lakeview through the triple and double sets of glass sliders. 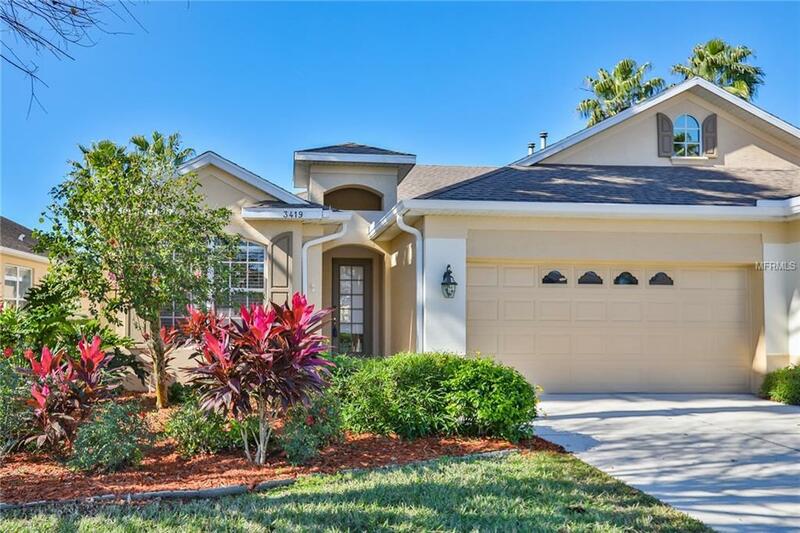 If you are looking for a great Florida villa close to shopping and restaurants be sure to check out this home. Built in 2003 the home boasts higher ceilings with a wonderful open floor plan. If you are a chef that loves to entertain guests while you cook, you should be happy cooking on the gas stove top and having your guests sit near you at the bar area. The lakeview can be enjoyed from the dining area, living room, eat in kitchen area, master bedroom and, of course, the lanai. The Master retreat has his and her closets and the master bath offers his and her vanities with a walk in shower. The lanai has sliding windows with a separate air-conditioner providing an opportunity for year-round usable space. Timberlys low HOA fees include exterior painting, lawn mowing, hedge trimming, fertilizing & lawn pest control. Internet & the bronze cable package is provided by Spectrum and also included with the HOA fees! So forget about mowing the lawn and just head over and enjoy the heated community pool.